Thibeault's Table: A HOLIDAY GIVEAWAY !!!!! If you would like to get your name in the DRAW all you have to do is leave a comment. remember to mention that fact in a comment here. Thanks you for the generous giveaway...could use this magnetic knife board~! Wow. An awesome giveaway. I'd LOVE any of your beautiful products. Pretty! 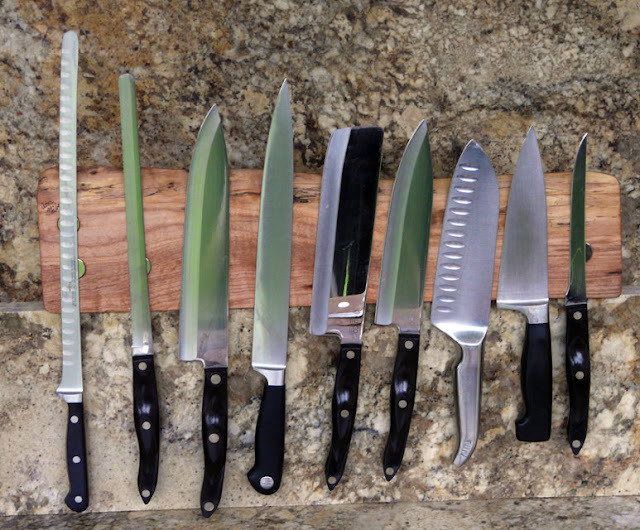 I've always wanted a magnetic knife rack. Awesome giveaway! I have linked Thibaults Table to The Literate Epicures of Newotwn Blog, which is my local cookbook book club. If I am the luckt winner, your gorgeous knife block will be up for a silent auction as a fundraiser for the group. Thanks so much for your generosity! I'd love to win one of your beautiful creations! Merry Christmas to you and yours. I would be just over the moon to win one of these...it is gorgeous! Just bought my first really good knife would love to have the magnetic holder. Will be sure to like it on FB. Your work is beautiful! It is the perfect way to display my custom knife collection. gorgeous! very unique and sure to be a conversation piece. Thanks for the chance to win and Happy Holidays! I just found your blog today and just completed making the white chocolate fudge (I added toasted macadamia nuts)...then lo and behold I stubble upon your give-a-way! I'm posting in on my fb page too! I would love to win the knife magnet. I have enjoyed the two boards I purchased from you. Especially the last one, it is beyond beautiful. Your boards are beautiful. Thanks for offering the give away. Merry Christmas. I've had my eye on these knife boards for a while now! I would love one to match my boards of yours! Merry Christmas to you and your family. Thank you for sharing all your hard work. I love your food blog! Thank you for sharing! Please put my name in the drawing. Thank you! As I am always drooling over your knife racks and cutting boards I am happy for a chance to win one! Oh your work is very beautiful: cooking and boards. I love your blog. Thanks for the opportunity on winning this set! The knife rack is awesome! Love your recipes! Misti, just to clarify, the Giveaway is the Knife rack, not the knives. LOL!! Ann, you know what a fan I am of your boards! What a fabulous giveaway! So gorgeous! I would love for this to hold up the new knives I've asked for this Christmas! what a great year end giveaway. Thank you for all the drool worthy recipes and the boards that really are a work of art. those look awesome! would love one! Just found your site! Love it! Bookmarked it for a lot more reviewing! Hi Ann! Just got home from our holiday with family... You know how much I love your work!! This is a lovely giveaway! The wood is simply beautiful! I would love one of your beautiful knife blocks for my kitchen. I have lots of magnetic knife blocks in my kitchen already, but they are all in use for spices. Hope you had a lovely holiday. I want to be entered in the giveaway! 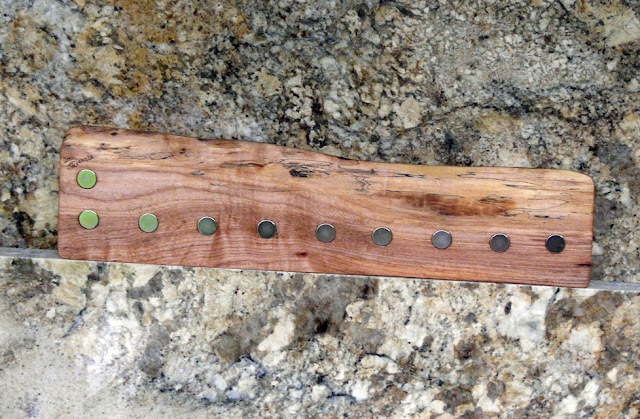 This magnetic knife rack looks awesome! Me too! Me too! These are gorgeous, thanks so much! I have loved watching your cutting board project evolve and have enjoyed all of the exquisite boards you post. I am so excited by the knife holders. What a wonderful and beautiful idea. Put my name in the bowl, please. What a wonderful give-away! I'd love to win the knife rack. I use my beautiful bread board from you everyday! Happy New Year to you and Moe! Please consider me as a candidate for your give-away. I can't imagine anything classier than a Thibeault knife rack in my kitchen. Happy New Year to AnnT and Moe. What a great idea! I love all the beautiful pieces. Happy New Year to Ann and Moe! Wow.....A chance to win one of Ann and Moe's knife racks! Put my name in the hopper please.....and I'll post to my status on FB. Wonderful to see you are from Vancouver Island, too! Thanks, I would love to win the giveaway. What a generous and beautiful magnetic knife board. I would love to win this for my son. Ann - love your blog, your recipes, your photos. Your wood products are gorgeous too. I would love a chance at your magnetic knife board. Thanks very much and happy holidays to you and yours! Gorgeous Ann! Hoping to be the lucky winner! You can email me through my gardenweb page. You're our go to recipe guide Ann...Always check with you first before proceeding onto the menu planning. Thanks for that! I am oklamoni on the cooking forum. Nice way to start the New Year for some lucky person. Sorry I hit the wrong key and had to try again. soonergrandmom from cooking forum. Ann, Moe does such beautiful work! It'd be an honor & privilege to own one of his beautiful boards! Oh yeah, am definitely going to mention the giveaway on FB! I would love to win one of those beautiful knife holders. I'll be sharing on Facebook, too. Thank you for participating and for your kind comments. If your email address is not available on your blog or website, please make sure that you send it to me via email before the draw. If I can't get a hold of the winner I will have to draw another name. Ann, your artistry is awesome: pictures, culinart delights, the wood work with Moe... and your generosity abounds! What a cool thing to do!! Wow, these are made by you and your husband. I love them, please add my name. You are the one who gave me the courage and instructions on how to cook a ham and I have been doing it ever since. Thanks for all your help with all your recipes and instructions. Your creations are beautiful! I love them all!! I've not commented before, because I've never been able to make my computer allow me to comment, we'll see if this works, since I don't do Facebook. Of course, I've never been anonymous before, LOL. Love it - Nice offer!!! What an awesome, generous giveaway, thank you! Love your blog and your recipes! Ann, you and Moe make wonderful little elves; beautiful work. Please Ann, do not add my name to the giveaway. I just came by to take a peek after viewing this on the CF, and also to wish you a happy new year. Your woodworks are absolutely beautiful. I've checked out your blog before but for recipes. Will check out your Facebook page, too. As nice as this would look in my kitchen, I'd have to give it to the Kid for her new house. Thanks...Ann and Moe your work is beautiful. oh my gosh,I love it,It would look great in my 1700 yr old house. Just a reminder - Anyone that has signed in under Anonymous, or doesn't have a link to their email address, please email me with your name and email address so that I can actually contact you should you win. Please enter my name. Thanks! Time to come out of lurkdom... I so enjoy reading your blog and especially admiring the photos. Well done Ann! Oh no, hope you didn't have the draw yet, I just checked my e-mail and the one I sent you bounced back to me. I entered last week. I will resend another e-mail. Hope I'm not too late. Happy New Year's! This is an amazing piece.